Weston Observatory seismographs recorded a M2.6 near Sidney, Maine on June 21st at 6:15am. Below is a screenshot of the PKME seismic station in central Maine. Weston Observatory seismographs recorded a M5.0 earthquake 25km NNE of Shawville, Canada at 09:43EDT today (May 17th). They also recorded a smaller M3.7 aftershock. These magnitudes may change as new data comes in. Weston Observatory seismometers recorded 4 earthquakes during the evening of January 15th to the morning of January 16th. A M3.5 earthquakes and a smaller aftershock near Val-des-Bois, Quebec, an M1.4 earthquake near Wiscasset, ME and an M2.2 near Saranac Lake, NY. Below is a screenshot of the NCB station in Newcomb, NY. 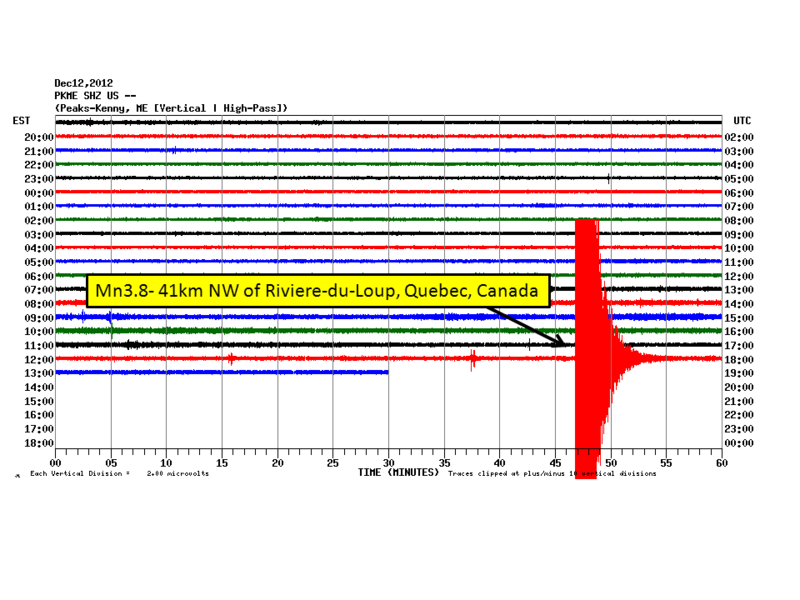 The two Quebec earthquakes as well as the New York earthquake are quite visible. The smaller Maine earthquake is not very visible here. Go to our main website (aki.bc.edu), select “Current Seismograms” and use the “Short-Period” filter for station PKME to see the Maine earthquake. Weston Observatory seismographs recorded an M2.5 earthquake that occurred on January 14th at 1:19 PM. The earthquake was located 6km N of Boothbay Harbor, ME. Below is a screenshot of the WES seismic station. Weston Observatory seismometers recorded a Mn3.8 earthquake located 41km NW of Riviere-du-Loup, Quebec, Canada at 12:47pm EST 12/12/2012. The magnitude of this event may change as new data is collected. The earthquake was felt in both Northern Maine as well as portions of the Quebec Province. 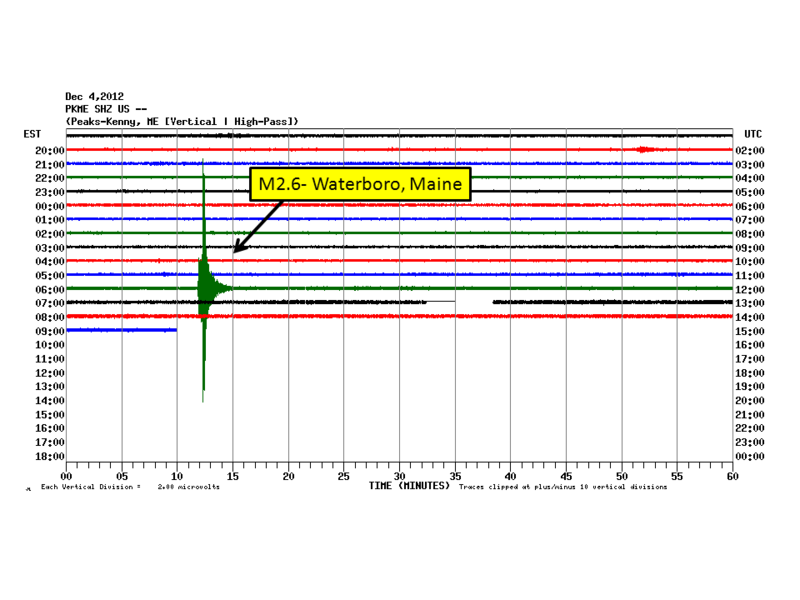 Below is an image of the PKME seismic station in central Maine. 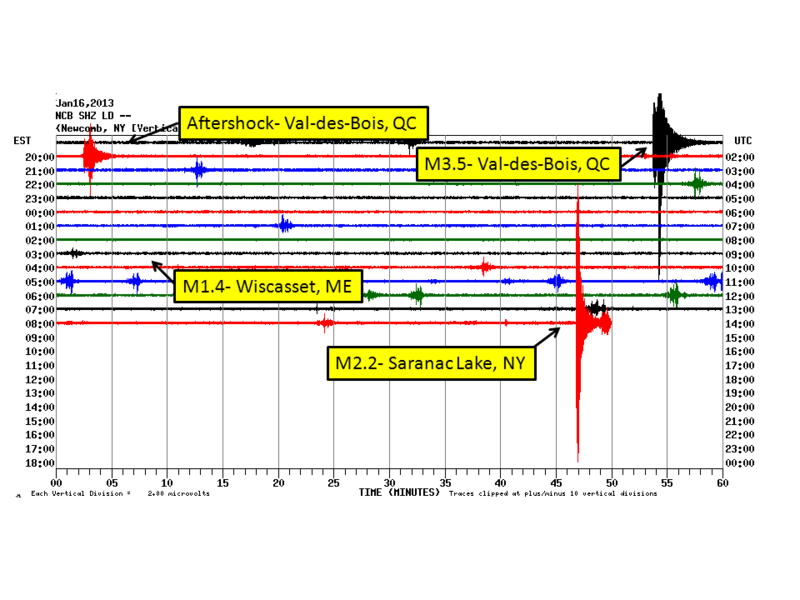 Weston Observatory seismometers recorded a Magnitude 2.6 earthquake located 6km S of Lake Arrowhead, Maine. 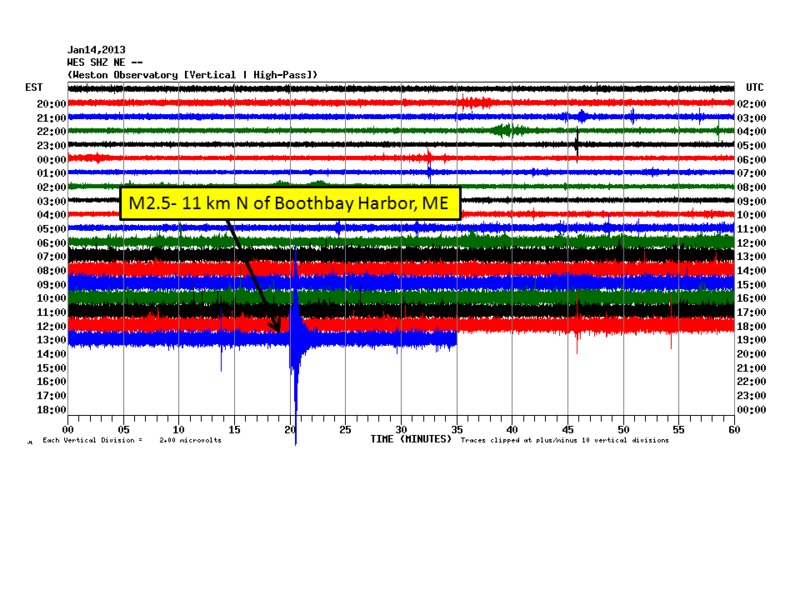 Below is a screenshot of the PKME seismic station located in central Maine. 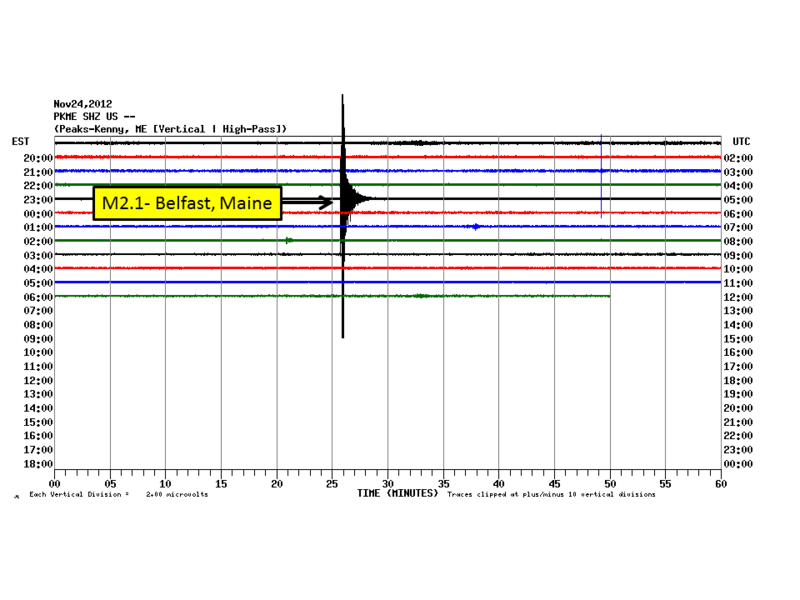 Weston Observatory seismometers recorded an Mn2.1 earthquake on Nov 23, at 11:24pm near Belfast Maine. 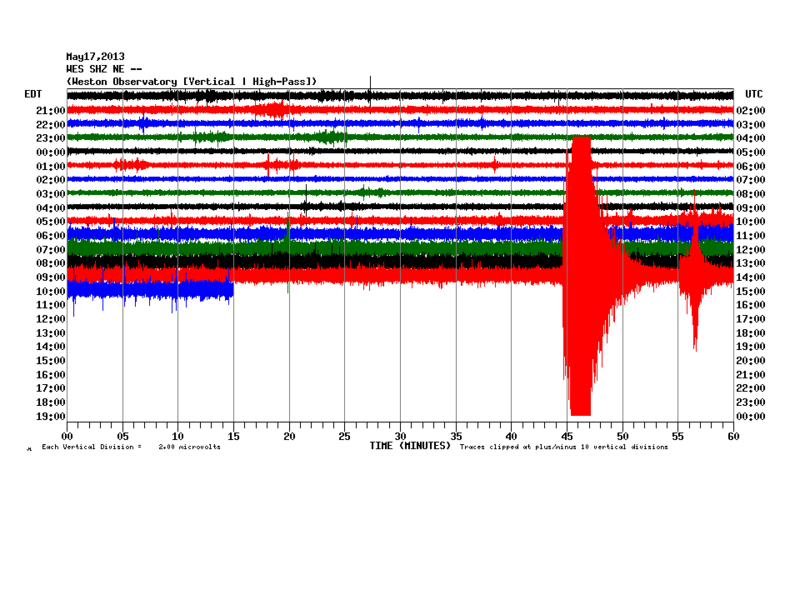 Below is a screenshot of the earthquake recorded at seismic station PKME. 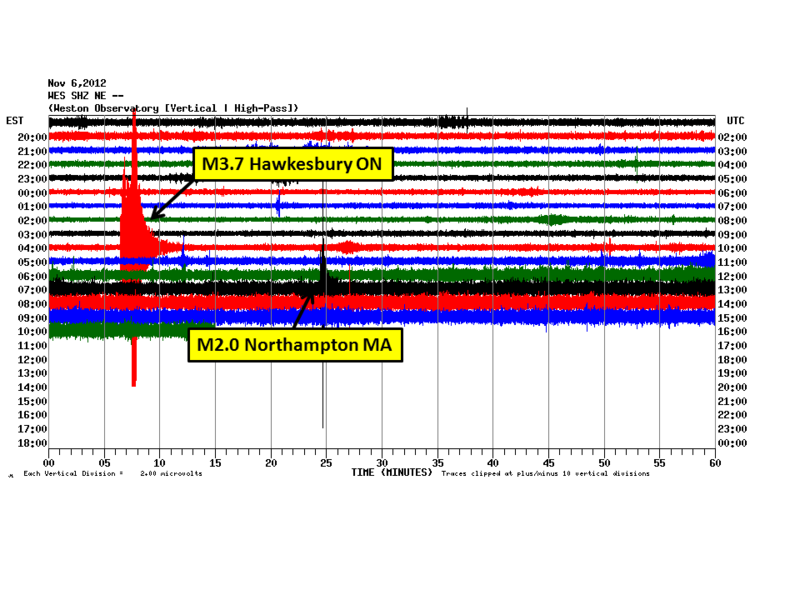 Weston Observatory seismometers recorded several earthquakes occurring in and around New England during the morning of Nov 6th, 2012. The seismogram shown below is from the WES seismic station in Weston, Massachusetts. 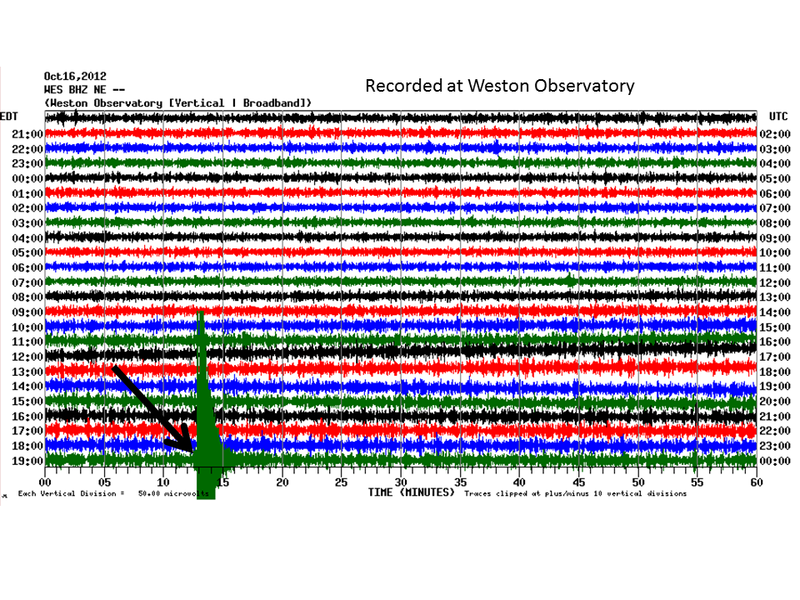 Weston Observatory seismometers recorded a Magnitude 4.6 earthquake located 6km (4miles) WSW of Hollis Center, Maine. Below is a screenshot of the WES seismic station located in Weston MA. 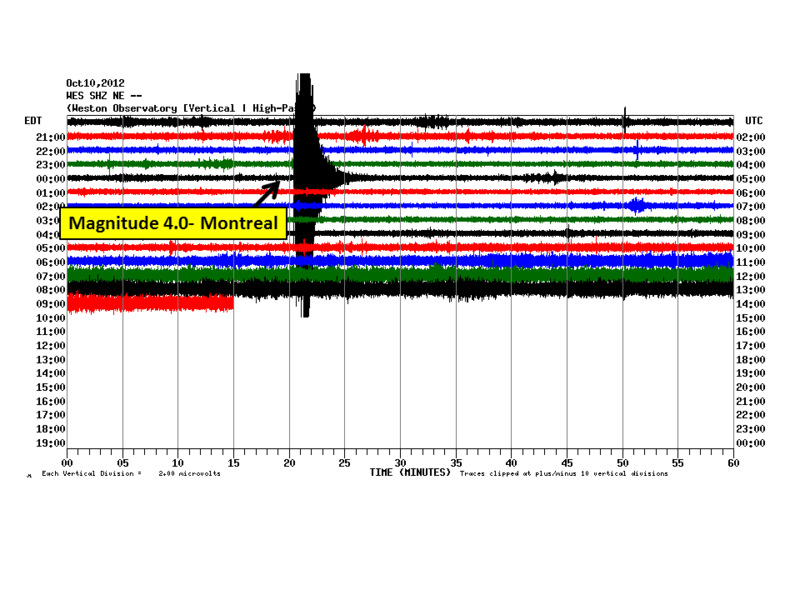 Weston Observatory seismometers recorded an M4.0 located approximately 33km ENE of Montreal. The earthquake occurred at 12:19am on October 10, 2012.